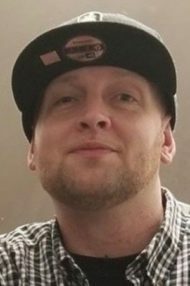 Cory A. Ruder, 33, of Lancaster passed away unexpectedly on Wednesday, April 3, 2019. Born in McKeesport, PA he was the son of Wendell L. Ruder fiancé of Sherri J. Foster-Hohman and Judy A. (Webber) Ruder both of Lancaster. He was a graduate of McCaskey High School. Cory was a sports enthusiast and enjoyed watching most Pittsburgh sports teams. He was a devoted father who loved his children and his family. In addition to his parents, he is survived by his children, Lainey and Teaghan Ruder both of Lancaster; brother, Kyle L. Ruder husband of Kelley M., of Lancaster; maternal grandmother, Dorothy B. Webber of Pottstown, PA and his nieces, nephews and extended family. He was preceded in death by his paternal grandparents, George and Patricia Ruder and his uncle, Glenn Webber and aunt, Mora Kenders. A Celebration of Cory’s Life will be held at 7PM on Thursday, April 11, 2019 at the Charles F. Snyder Funeral Home & Crematory, 414 E. King St, Lancaster, PA 17602. Interment will be private. Family and friends will be received from 6-7PM at the funeral home on Thursday. In lieu of flowers, contributions in Cory’s memory may be made to Addiction Recovery Systems of Lancaster, 2192 Embassy Dr, Lancaster, PA 17603. I will never forget my times with Cory, he made me laugh like no other. He had a big heart and i will cherish my memories of him.Im so sad to hear of his passing, he was a good friend. So sorry for your families loss. Rest in peace my friend. I am so very sorry for your loss. I had the pleasure of meeting Cory and he was a great guy. He will be missed by many. You are all in my thoughts and prayers. I’m so sorry for your lost, my most deepest condolences go out to the family, i had the pleasure of being friends with Cory and he was an awesome person, he will be missed. May you R.I.P. Cory. Gone but you won’t be forgotten. Our hearts are filled with sympathy and want to express to you our sorrow during this time. We wrap our Blue Band around you and share in your grief. Wendell and Sherri J, we send our deepest sympathy and love and just the couple times we saw Cory we so enjoy being with him. Wish we could be with you and the family and so we pray for peace and comfort for you all. Gods arms will bring you strength. He was a fine young man and good friend to our son years ago. He was always welcome in our home. I’m sorry for your loss. I can understand the pain the family must be in as you start to face this new reality. Let me tell you that you are NOT alone! I lost my brother December 2017 to addiction. I pray that you find peace and comfort during this time. I am very truly sorry for the Loss of Cory. May He Rest In Peace and Soar with the Other Angels. God Bless You All In Your Time of Sorrow.